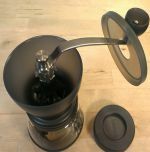 Stylish transparent coffee grinder - A real modern classic, neat enough to leave out permanently due to its chic exterior. Has a suction lever to secure to work-surface if required and the handle can be stored inside after use. Ceramic burr to grind beans to perfection. All metal parts are stainless steel and all parts are washable. Approx capacity 40g.